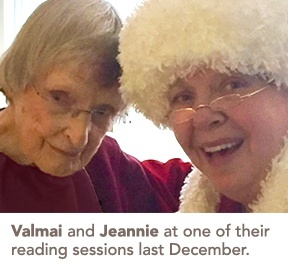 Jeannie, a volunteer at Cherry Park, has been reading with Valmai for a year. Somewhere between the pages of a book they became close friends. Every Tuesday between 10:30 and noon, Jeannie and Valmai disappear into a world pressed between inky pages. Jeannie previously worked as a librarian for 20 years, and enjoyed helping people find something that inspired them. For the past year, she’s been using those same skills to find books to read with Valmai, who can no longer see well enough to read on her own. The two started their journey reading a book Valmai’s son had given her about an Iron Man athlete, which they enjoyed. Jeannie says she’s looking for something about 150 pages long for their next read, because they can only get through so much in an hour. Recently, Jeannie has been thinking of holding a few zentangle art programs at Cherry Park. Zentangle is a form of detailed doodling that repeats patterns and designs. To Jeannie, zentangle is a fun and relaxing stress reliever. She’s taught several zentangle programs outside of Cherry Park to both children and adults at local community libraries. She also enjoys attending art programs at Cherry Park with her sister, who lives at the residence. Coincidently, right beside Valmai.